A graduate of the Rhode Island School of Design and an instructor there from 1982-2006, Michael Glancy has developed a combination of aesthetic/scientific approach to his glass sculptures that reflect his understanding of both macro- and micro- world views. 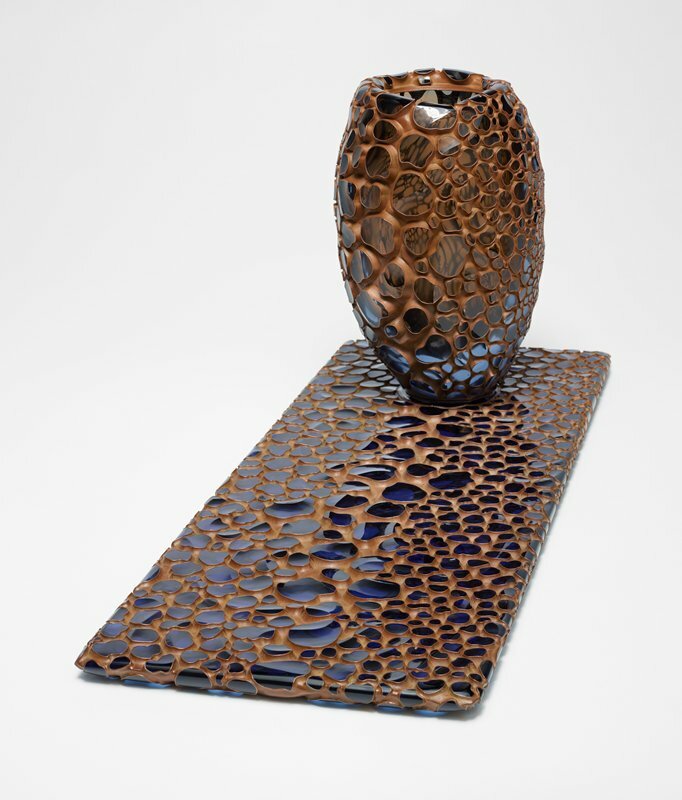 Inspired by irregular patterns of cells as well as strict geometry, Glancy creates exquisite, dense vessel forms that are sandblasted, carved, and combined with copper as an opaque foil for the gem-like colored glass. The vessels are most often presented in concert with or in contrast to a blown or plate-glass base. In Biomorphic Ganglia, the vessel and the base form a continuous landscape, such as rocks in a stream, or molecular reference; the multiple colors of the vase conjoin with the engraved blue plate glass seamlessly.